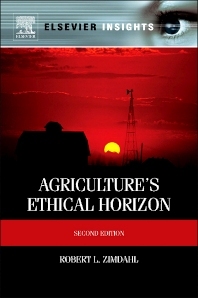 The second edition of Agriculture's Ethical Horizon is a carefully considered application of philosophical concepts, such as utilitarianism and positivism, to the practice of agricultural science. Author Robert Zimdahl argues for an approach to agriculture guided by foundational values, and addresses the questions: What are the goals of agricultural and weed science? What should their goals be? How do and how should the practitioners of agriculture address complex ethical questions? This book engages students, researchers, and professionals across disciplines including horticulture, soil and plant science, entomology, and more, all without requiring a background in philosophy. It examines topics such as scientific truth and myth, moral confidence in agriculture, the relevance of ethics to sustainability, and biotechnology. New to this edition is a chapter examining the raising, housing and slaughter of animals for human food, and a chapter on alternative and organic agricultural systems. What Research Ought to Be Done? Why must Sustainability be Achieved?